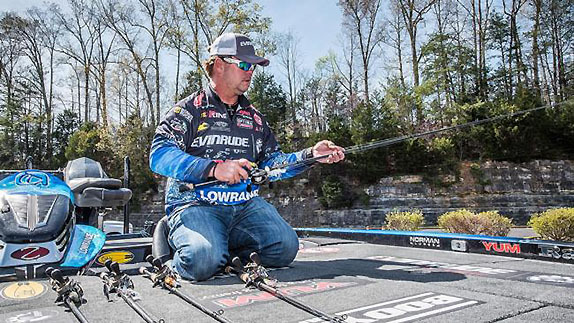 Scott Martin caught the biggest stringer on both the first and last days of the Lake Cumberland FLW Tour. 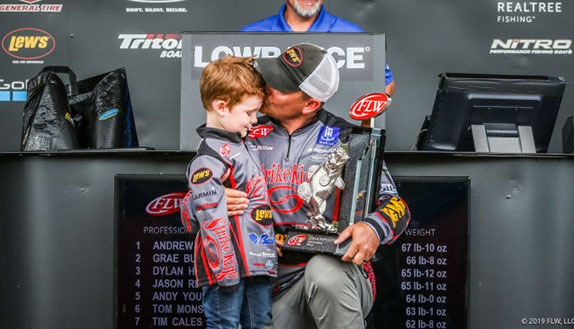 One of the best anglers in FLW Tour history had a nightmarish day on Sunday at Lake Cumberland, and another one capitalized to extend a career record that he already owned. Scott Martin captured his seventh Tour victory (nobody else has more than five) as his three-species stringer weighing 13-12 gave him a four-day total of 60-01. 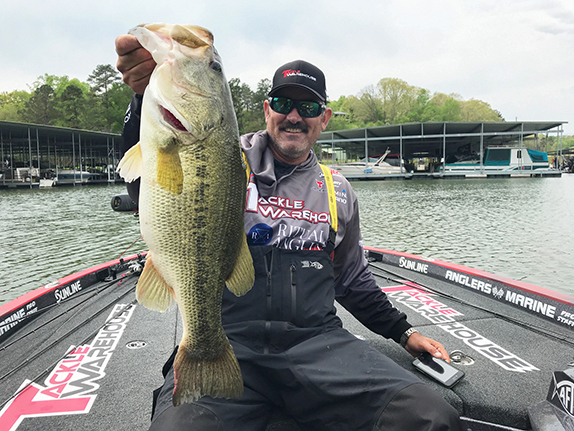 He began the day facing a 3 1/2-pound deficit to three-time Angler of the Year Clark Wendlandt, who'd been averaging nearly 17 pounds per day, but the Texan failed to catch a single keeper and plummeted to 9th place. "I'm a little bit in shock," Martin said. "I thought I'd thrown this one away with some of the fish I lost this week." Wendlandt, who'd been relying on smallmouth that met the stringent 18-inch minimum-length requirement, couldn't get the big bronzebacks to cooperate under the blue skies and calm conditions. "The kiss of death for me was that yesterday between 1 and 3 (p.m.) I caught probably 12 smallmouth and three of them were keepers," said Wendlandt, a four-time Tour winner. "I kept thinking today that they were going to start biting, it was going to get better, once I hit the right stretch. That never happened. "I'd also been catching (spotted bass) and largemouths in the back of creeks, but that didn't work either. It's disappointing because you don't get that many chances to win and this one was set up pretty well for me. I just didn't make the adjustments I needed to. I wouldn't say I'm devastated, but it stings." Barry Wilson, a sixth-year pro from Alabama, turned in a career-best runner-up finish as a 13-02 stringer gave him a 58-06 total. Terry Bolton was 3rd with 57-05 after boxing 12-06 on day 4. 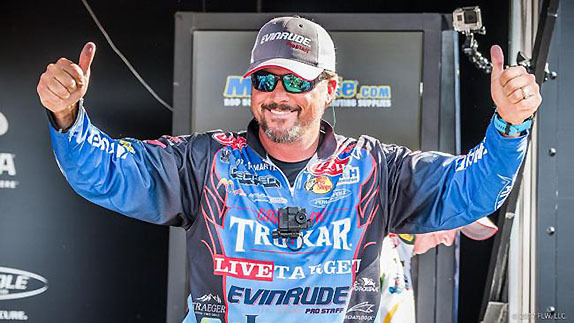 Matt Reed, in his first year on the Tour after a long stint with the Bassmaster Elite Series, posted his second straight top-5 showing with a 55-15 aggregate (13-01 on day 4). Scott Canterbury was next with 55-07 (12-00). 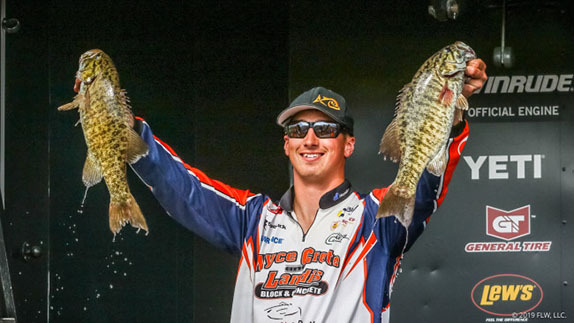 Martin, the 2015 AOY and 2011 Forrest Wood Cup champion, took sole possession of the all-time wins record last June when he prevailed at Lake Champlain, breaking a tie with David Fritts and Brent Ehrler. Prior to that, he'd gone four years without a win. Martin's final-day bag contained all three species � largemouth, smallmouth and spotted bass. Bryan Thrift, the 12th-place finisher at Cumberland, holds a commanding 52-point lead over 2nd-place Wendlandt in the AOY race with the season more than halfway complete. 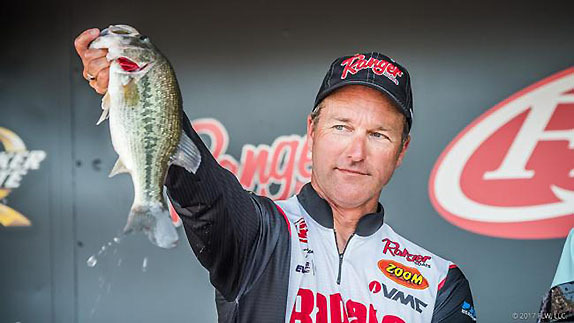 Martin, who started the campaign with a 127th-place bomb at Lake Guntersville, has climbed to 26th. The circuit takes the next two weeks off before resuming April 27-30 with the annual derby at Beaver Lake in Arkansas. Martin, who began the event by catching a tournament-best 19-07 stringer, had two solid largemouths, two chunky spots and a big largemouth in his final bag, which was again the best of the day. He brought multiple species to the scale in each round. A jerkbait that enticed suspended fish was his primary weapon for the week, but today he pulled out a wakebait on a whim and it produced a couple of keepers. He also had a period of extreme frustration with it when a knocked off a 3-pounder with the rim of his net. He spent most of the tournament in the lower third of the lake, about a 45-minute run from the launch in Somerset, Ky. While using his Garmin unit to plan his return trip on day 4, he noticed that he'd have eight spare minutes, which would allow for one stop and a few casts. "I wanted to find a short pocket with one tree in the back of it," he said. "I ran like 37 miles at 70 mph and I'd gone by hundreds of pockets and I was starting to run out of options. Barry Wilson thought he had a chance to win right up until the conclusion of the weigh-in. 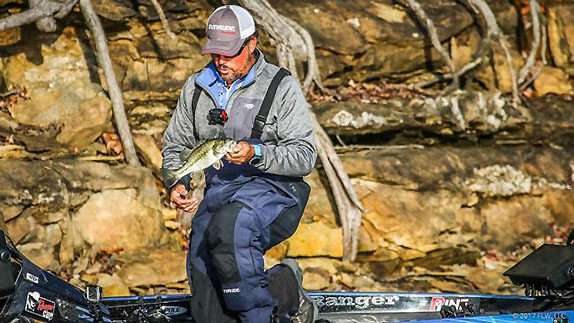 "I turned a corner and saw one pocket that had what I was looking for, so I rolled in there and on my first cast with a jerkbait I caught a 3-pound largemouth that got rid of a pound-and-a-half spot. I might've still won without that fish, but it would've been really close." Right up until Martin weighed in, Wilson thought the victory might fall to him. "It's kind of disappointing," he said. "A lot of people though I'd won it because Scott told people he only had 12 pounds and he ended up having 14. "Everything happens for a reason and like my mom always told me, 'all in due time.' It wasn't my time, but my time will come." Wilson, who threw a squarebill crankbait and a ChatterBait, went through seven keepers on the day and his bag was topped by a pair of 3 1/2-pound largemouths. He caught one of those on his final cast to cull a 2 3/4. "The surprising part was I went (to his best area) first and I had four by 9 o'clock and caught the fifth at 10:30. I'd been catching them all after 11. "After that I really wasn't catching anything except some shorts until that last cast." Bolton had no qualms with his finish. "It was a great tournament and I'm tickled to death," he said. "I don't have any regrets. I got to fish the way I like and I caught everything that bit, but I just didn't get the one big bite I needed. Terry Bolton threw a spinnerbait all four days. "Looking back at the weights for today, I really wasn't too far off of anybody else. I had a good day and ran some new water and everything went well." He threw a spinnerbait for the vast majority of the tournament, but caught a couple of fish flipping a tube. Reed hopes he can sustain the momentum he's picked up over the past two derbies. "I never knew what I was going to catch. I was actually fishing for smallmouth, but I ended up weighing in more of the others." Canterbury's best finish of the season moved him up to 5th in the AOY race. "I feel great about my tournament overall," he said. "I fished a lot of new water every day and a lot of new water today. It was a little tough on me today, my weight was down a little, but I think everybody's was. "I was fishing the way I like to fish and I always felt like I had a chance to win. With two big bites, I could've been right there." He caught eight keepers on the final day. He weighed all largemouths except for day 1, when he bagged three keeper smallmouths. "This is a pattern lake and it's big, so it spreads everybody out," he said. "I like these big reservoirs because I like to be able to hit 30 places in a day. This one really laid out well for the way I like to fish." > Day 4 stats � 10 anglers, 7 limits, 2 fours, 1 zero. > Wendlandt employed a jerkbait/crankbait combo attack with a Strike King KVD J200 and a Strike King 3XD. "I think what happened today is those smallmouth started spawning, but they were too deep to see them," he said. "They got to the point where they didn't want to bite anymore."